TVP Polonia reporter reporting on the Parsons Green bombing in September 2017. TVP Polonia (also known as TV Polonia, Telewizja Polonia or Telewizja Polska Polonia) is the international channel of the Telewizja Polska (TVP). The channel is co-funded by the TVP and the Polish Ministry for Foreign Affairs and broadcasts from the TVP headquarters in Warsaw. TVP Polonia is targeted at Polish-speaking audiences outside Poland, and it broadcasts many of the shows also broadcast by TVP's domestic channels in addition to news from Polonia/Polish communities around the world. It's launched October 1992 (trial), March 1993 (regularly). TVP Polonia is available in many countries around the world via cable or satellite. It is also transmitted unencrypted from various satellites. Broadcasting via Astra 19.2°E started in 2005, but was ceased on 31 December 2014 due to economic reasons. ^ "TVP1 i Polsat liderem rynku telewizyjnego, TVP Info z największym wzrostem w czołówce (top 100 za 2015 rok)". wirtualnemedia.pl. ^ http://old.rrt.lt/images/21195/teo2_n620.png - TELIA2 network total coverage. All transmitters will be turned off by 18 September 2018. ^ https://www.rrt.lt/aktuali-informacija/ - TELIA1 and TELIA2 networks dismantlement schedule and other information about relevant radio and television matters (in Lithuanian). 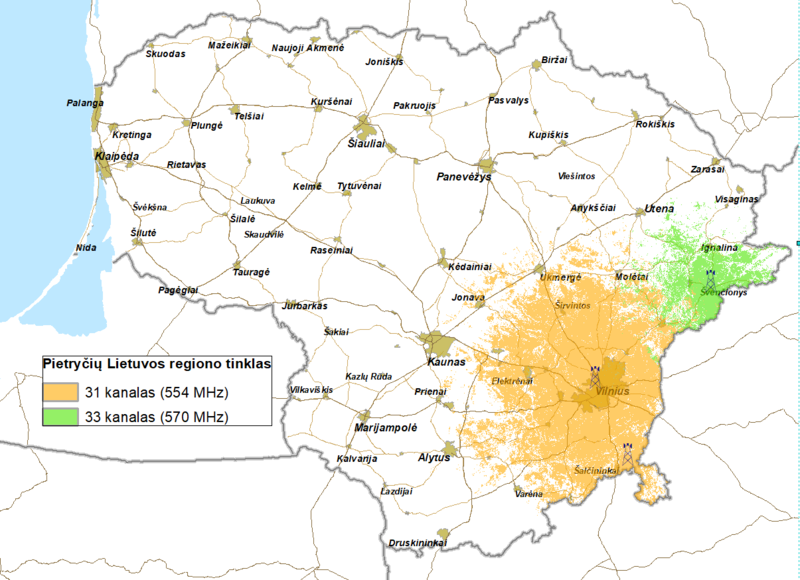 ^ https://www.rrt.lt/wp-content/uploads/2018/07/pietryciu_t509.png - South-east Lithuania region DVB-T MUX coverage picture. ^ https://rrt.maps.arcgis.com/apps/webappviewer/index.html?id=416f0a4f9fb1404bb4e03485fc36690d - Interactive south-east Lithuania region DVB-T MUX coverage map. ^ https://www.rrt.lt/radijo-spektras/rtv-transliavimas/televizijos-transliavimas/ - Information about DVB-T channels in Lithuania (in Lithuanian). ^ http://old.rrt.lt/lt/vartotojui/radijas-televizija/programos.html - Information about DVB-T channels in Lithuania (in Lithuanian) [old website version]. ^ kingofsat. "Search Results for - KingOfSat". en.kingofsat.net. This page was last edited on 15 January 2019, at 12:26 (UTC).